252 pages | 40 B/W Illus. Why Architects Matter examines the key role of research- led, ethical architects in promoting wellbeing, sustainability and innovation. It argues that the profession needs to be clear about what it knows and the value of what it knows if it is to work successfully with others. Without this clarity, the marginalization of architects from the production of the built environment will continue, preventing clients, businesses and society from getting the buildings that they need. The book offers a strategy for the development of a twenty-first-century knowledge-led built environment, including tools to help evidence, develop and communicate that value to those outside the field. Knowing how to demonstrate the impact and value of their work will strengthen practitioners’ ability to pitch for work and access new funding streams. This is particularly important at a time of global economic downturn, with ever greater competition for contracts and funds driving down fees and making it imperative to prove value at every level. Why Architects Matter straddles the spheres of ‘Practice Management and Law’, ‘History and Theory’, ‘Design’, ‘Housing’, ‘Sustainability’, ‘Health’, ‘Marketing’ and ‘Advice for Clients’, bringing them into an accessible whole. The book will therefore be of interest to professional architects, architecture students and anyone with an interest in our built environment and the role of professionals within it. List of Illustrations. Acknowledgments. Introduction. Part 1: The Undervaluing of Architectural Knowledge. 1.Public Image, Misinformation and the Bogey of Dispensability. 2. The Profession. 3. Cracks in the Professional Foundations: The Right Body of Knowledge. 4. The Research Culture of Architects. 5. The Value Agenda. Part 2: The Value of Architects. 6.So What is an Architect? 7. The Value of Social Architects. 8. The Value of Cultural Architects. 9. The Value of Knowledge Architects. Part 3: Making the Most of Architects. 10.Education for Uncertainty. 11. Developing a Shared Language of Research. 12. Models of Academic and Practice Research Collaboration. 13. Incentivising Research in Practice. 14. Risk and Research Strategy. 15. Managing Knowledge in Practice. Conclusion. Index. Flora Samuel is Professor of Architecture in the Built Environment at the University of Reading and the first RIBA Vice President for Research. She was also the first woman Head of the University of Sheffield School of Architecture in the UK. This book was written as a result of her concern about the amount of waste and suffering caused by the quality of much of our built environment. 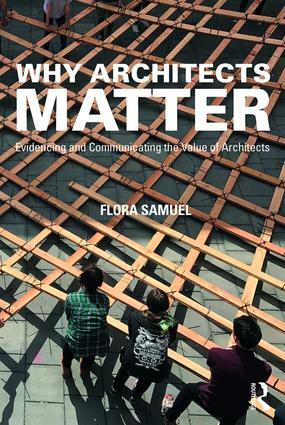 She has received extensive funding from the Arts and Humanities Research Council for her work on the value of architects and on the way in which they evidence that value. Being passionate about breaking down the barriers between academia and architectural practice, she has, since 2012, embroiled herself in the activities of the Royal Institute of British Architects as a twice-elected National Council member and Chair of its Research and Innovation Group. She also delivers research training in practice and is a supervisor of practitioner PhDs. Flora Samuel is known for her unorthodox writings on Le Corbusier, about whom she has published extensively. A mother of three daughters, she is based in Wales.